Eastern Beach Caravan Park01493 720367work Holiday ParkEastern Beach Caravan Park at Caister-on-Sea near Great Yarmouth enjoys a stunning, peaceful setting directly on the golden sands of Caister-on-Sea beach. Family-run and with fabulous sea views, our holiday caravans provide the ideal base from which to explore Norfolk and The Broads. We have spacious and well designed holiday caravans available to hire, perfect for a family holiday, weekend break or stay-cation by the sea. 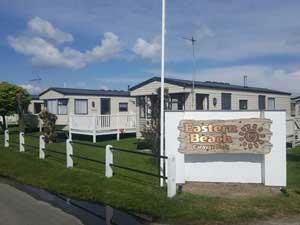 Choose from a beachfront, sea view or park view caravan for your Norfolk break. With a choice of 2 & 3 bedrooms all our holiday caravans are fully equipped with comfortable furnishings and everything you need for a break away. Our on-site facilities include a bar and newly renovated clubhouse and cafe, with exciting, seasonal entertainment. There's an arcade and games room to enjoy alongside an outside play area for the young children. We also have a launderette, small essentials shop within the reception area and a great selection of toys and books to share for those rainy days! For those who fancy their own little place right by the sea, we also have holiday caravans to buy. With competitive pitch fees and a 10 and a half month season, you can enjoy your holiday caravan by the sea as much as you like! Eastern Beach Caravan Park at Caister-on-Sea near Great Yarmouth enjoys a stunning, peaceful setting directly on the golden sands of Caister-on-Sea beach. Family-run and with fabulous sea views, our holiday caravans provide the ideal base from which to explore Norfolk and The Broads. Bring your dog on holiday too! We love our dogs at Eastern Beach and with a number of dog-friendly holiday caravans available take advantage of our direct access to the dog-firendly beach and bring your pet with you! Facilities for children: Cots availiable, Highchairs available, Outdoor play area Children welcome from any age. The region is easily accessible by road from all parts of the UK. Major trunk roads into Norfolk are the M11, A11, A12 and the A14 from London and the South-east, while the A47 and A14 serve the Midlands and the North. On approaching Great Yarmouth follow the signs for Caister-on-Sea. Go through Caister village until you reach the mini roundabout, turn right into Beach Road. Continue to end and turn left, Eastern Beach is on your right hand side.